The figures show that one in 10 trucks has defects or dangerous faults, and VicRoads says it now puts trucks under the microscope for more intense inspections. Stunningly, the authorities said they have found defects such as a wrench being used in place of a steering wheel, and a timber box for a seat. In the last financial year, 1057 trucks were taken off the road due to major defects including no brakes and the use of alternate items. A further 4142 lesser defects were identified in the same year, including trucks with dodgy steering, worn, bald and damaged tyres, broken lights, loose bolts, damaged seatbelts, and all kinds of suspension issues. The authorities say faulty trucks are adding to challenges they face as they battle record ­numbers of drivers on drugs while driving, especially ice. Trucks with major faults can be banished from the road immediately­ given one hour to travel to a repairer, while minor faults must be fixed within seven days. 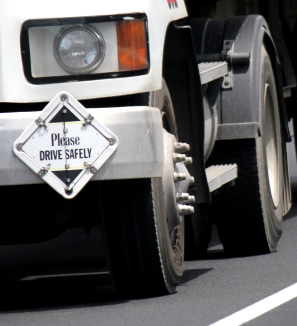 2014 sawe 59 fatal crashes involving heavy vehicles - up 90 per cent on the previous year. VicRoads has stripped heavy vehicles licenses from 11,704 drivers for road ­offences including drugs and speeding, while Police booked 156 ­drivers for drugs. “The majority of heavy vehicle operators have comprehensive vehicle maintenance programs, but it is clear that some business owners do not maintain their fleet to the required standard,” VicRoads regulatory services­ director Eric Henderson told News Corp reporters. “VicRoads is committed to improving the safety of all road users by ensuring unroadworthy heavy vehicles are ­addressed and removed from the roads where necessary,” he said. He said VicRoads would work with drivers and owners to emphasise safety and change how they prioritise it.